EMDR (Eye Movement Desensitization Reprocessing) has captured the attention of brain researchers and clinicians as a means to help traumatized clients reorganize and reprocess traumatic experiences. Our clinicians have been trained in this process and effectively utilize EMDR with clients. Clinicians and clients enthusiastically report profoundly positive results from this process. EMDR is a highly skilled and successful form of psychotherapy. Therapist and client work together to identify traumatic events and their associated blocking beliefs. The technique utilizes bilateral auditory, visual, and/or tactile stimulation while focusing on a traumatic memory. As the client remembers the event and associated memories while continuing the bilateral stimulation, he or she resolves troubling emotions and cognitively re-frames negative belief systems associated with the trauma. The resolution is lasting -- freeing the client from troubling issues from the past. Clients experience relief from the debilitating symptoms of post-traumatic stress disorder. After the initial sessions to determine if EMDR is an appropriate treatment and after trauma(s) and beliefs associated with the trauma are identified EMDR begins. It is our experience that clients progress more rapidly toward resolution of the effects of trauma when EMDR is utilized as part of the treatment protocol. EMDR is widely used to treat the effects of Posttraumatic Stress Disorder (PTSD). Additionally it has been successfully utilized to treat panic attacks, complicated grief, dissociation disorders, disturbing memories, phobias, body dysmorphic disorders, eating disorder, performance anxiety, stress, addictions, sexual or physical abuse, pain disorders. Who can perform EMDR sessions? 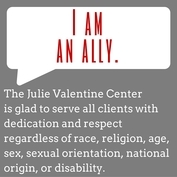 The clinicians at the Julie Valentine Center are fully licensed therapists. They are each EMDR trained practitioners.